researching autism on the internet..? I cannot tell people what to read, what to believe or what to buy. I am still trying to find that out for myself! But I have one advice. Be critical and selective. Question. Compare. Do not just believe everything you read on the internet. It’s that simple really. This entry was posted in autism, general and tagged ASD, asperger's, autism, google, information, internet, research, wikipedia on October 19, 2013 by starfish. A few days ago my 7 yo dashed across the room, running and jumping. As he went back to his chair he said, “Someone on YouTube just said it’s not possible to run and jump at the same time! But it’s NOT TRUE!” Those critical thinking skills are so necessary, but not everyone seems to have ’em. I’m sure enjoying your comics! Thanks for creating them! Very well seen by your kid – and providing living proof, too! unfortunately, it’s not always easy to challenge certain ‘truths’ touted on the internet, especially, in the context of autism research, where pages of quackery now dress up as scientific journals to convince the average reader of the veracity of their claims. Bwahahah! Love this! One day we will pay for guides through the internet the way we once paid for travel agencies to help us book trips! The hardest part is knowing where to start, just as you said above. A new parent is very vulnerable. 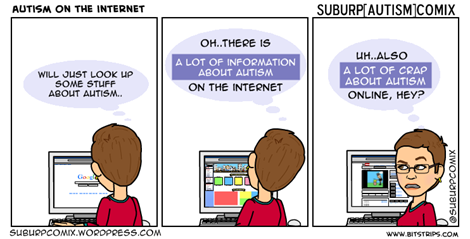 There certainly is a lot of crap about Autism on the Internet and I don’t want to add to it. I think that’s why I tend to shy away from blogging about my Asperger’s as I don’t see myself as somebody with any answers, just another person on the spectrum who still struggles with things. When I first got my adult diagnosis two years ago I’d visit forums but I found them so negative and depressing that I stopped. I’m looking into going to a support group so hopefully that will be much better. Sigh. Blogging about personal struggles is not for everyone. That’s why I am more comfortable with abstracting my thoughts and observation in the comics. I don’t have all the answers either but I try to chronicle my questions, I guess? I keep thinking what the root causes of that desperation are. It doesn’t seem to start until *after* the diagnosis. Before that, it just seems an undefined sense of “different”. And I think that it’s that point where we need to focus our efforts on. All the doomsday stories. The “epidemic” that is propagated by the media. The negative stereotypes. The doctors who treat it as a disease and only give parents information coloured by the medical model of autism. Or no information at all. That’s what needs to change. I think it all comes down to reviewing our expectations of life (and or parenthood) and our ability to accept, adapt and move forward. Parents of autistic children often talk about the ‘grief’ they felt after the diagnosis. I can’t say I felt that way, but I can imagine that, if you are stuck in one or another phase of grief (you know the ones..) you will not be able to find a healthy perspective and approach to autism, and you are wide open to let in all the media misrepresentation, the quackery and the – so well-meaning – therapies that have such medical and ableist approach. This is sound advice for any subject area. Oh absolutely. But it’s even more of a trap for desperate parents (I wasn’t desperate about my son’s autism really) who are looking for answers about their children’s conditions or behaviours and are emotionally in a state where they get easily sucked into all kinds of agendas, frauds or cure quackery. I remember cases on the news about children with cancer when I was young. I an not comparing autism w cancer but the behaviour of parents… Only now, there is the internet. One large trap for a gullible parent.